This post follows on from an earlier post on drawing with SQL Server, and explains how to create much more complex drawings using a couple of neat tricks and SQL Server spatial data. Firstly, apologies to those at my session at SQL Bits to whom I promised this blog post, I did say I’d try and get it posted in a week, and it’s been a month – but it’s here now! So, what are we trying to do? In my earlier post I demonstrated how to recreate a block drawing by tracing around the points on the edges and converting the results to SQL spatial data coordinates. This is ok if the image is a simple logo, but what if it’s too complex like a photo or sketch? It would take an age to trace so we need a more automated approach. At this point I’ll make my second apology, to Simon Sabin, who must by now think that Alastair Aitchison and I are stalking him. This post (and my associated lightning talk at SQLBits) derived from finding that Alastair had drawn the SQLBits logo over a month before I did mine. Feeling a little dejected I needed a new project. Simon set us a challenge of improving on it. One thing led to another and both Alastair and I started drawing portraits of Simon, and here we are. So, lets start with the picture. I chose Simon’s twitter profile pic. The first step is to convert the bitmap image into a vector image. A bitmap image is a collection of dots whereas a vector image is a collection of lines, better suited to drawing in SQL Server. 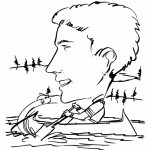 There’s a great website that takes care of this for you, vectormagic.com and you get two free conversions to try it out. Upload the image, and then download the converted file in EPS format. EPS is ideal for our purposes as it’s a simple text file containing one instruction per line. We can then convert each line into a SQL spatial line. I found the easiest way of converting the EPS lines into SQL spatial queries is with an Excel spreadsheet (download here). Paste the full contents of the EPS file into column A of the first sheet, the expressions in columns B to N strip out the coordinates and build them into SQL “geometry::STGeomFromText” commands. You may notice that we’re converting the ‘curveto’ commands in the EPS file into ‘linestring’ commands in SQL. This does result in an approximation of the curves, but this is barely noticeable in drawings like this. Worth noting that SQL Denali is planned to support curves, so we will be able to make it more accurate. Filter column O to remove the blanks (using the filter in cell O1), then copy the whole column to the clipboard. Then paste it into SQL Server Management Studio. Then we have to do a little tweaking to make it work. First we need to define a table variable at the very top of the query window. The first few lines of the query should look like this. 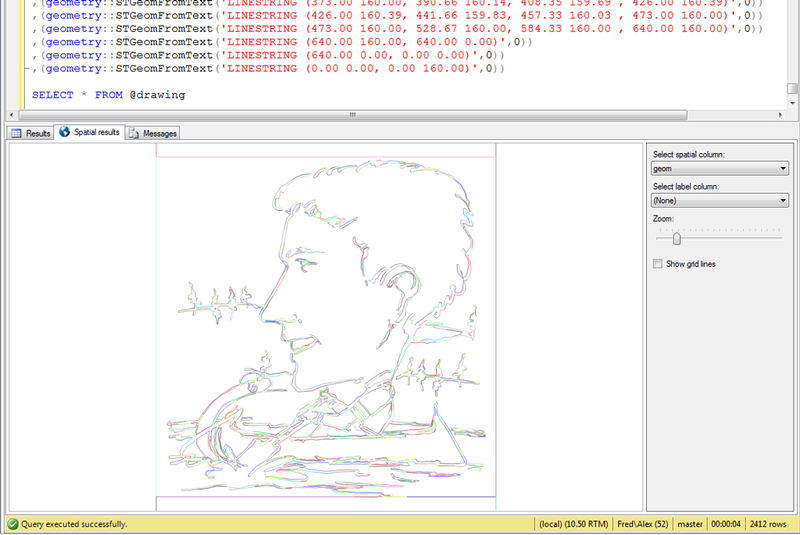 SQL Server art at work! How you can export as a picture ? Unfortunately there is no method of exporting the image from SSMS. You could use a tool like the Windows Snipping Tool to take a screen capture. Or if you want to automate it you’ll have to use a different query tool. SSRS would be a relatively straightforward option. I need to export charts from sql server geometry but with no luck. I want to automate but i think i have to use other ways. You suggest SSRS, have you a link for more examples? Take a look at https://www.purplefrogsystems.com/blog/2010/09/olap-cube-documentation-in-ssrs-part-3/ which uses spatial data in SSRS.